Every day, we depend on our water heaters for so many things. From washing our clothes and dishes to providing a relaxing hot shower at the end of a long day, we expect a lot from our water heaters. Unfortunately, many homeowners take their heaters for granted and don’t give them much thought until they stop working completely. At Larry & Sons, we’re here to help when you’re experiencing water heater problems, and we can help you determine whether you should repair or replace your system. While water heater repair is an effective solution in some cases, in many others, it’s best to invest in a replacement. If you think it might be time to replace your water heater, here are a few things to keep in mind. Do you need a new water heater? Here are a few signs! Your water heater is old. Even if you purchased a top-of-the-line water heater, it won’t last forever. In fact, tankless water heaters are only built to last 20 years at most, while conventional heaters with storage tanks only last eight to 12. If your water heater is nearing the end of it’s expected lifespan, you may want to consider buying a new one. You’re noticing higher energy bills. As your water heater ages, it becomes less efficient. If your energy bills have been climbing and you have an older water heater, up to 25 percent of your bill could be related to the cost of heating your water. Upgrading to a newer unit could save you a bundle. You’re running out of hot water faster than you used to. Sediment builds up in water heaters over time, decreasing the amount of water they can heat and store. If your showers are being cut short because you’re running out of hot water, it’s time for a new heater. Your heater has visible signs of damage. Leaks below your water heater and rust are definite signs that your system is nearing the end of its life. Inspect your heater regularly, and if you notice either of these things, you might want to consider buying a new unit before yours fails. You may also want to consider upgrading if you’ve been having problems and needing frequent water heater repair. If you need a new water heater in Hagerstown or the surrounding areas, count on Larry & Sons. Our certified plumbers are here to help you choose the heater that best suits your family’s needs, and they’ll install it promptly at a time that fits your schedule. 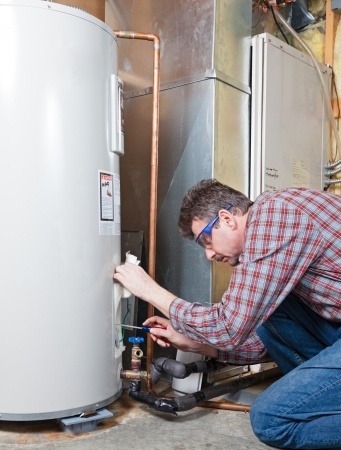 For professional water heater replacement, call Larry & Sons now at 301-733-5428.